Does Truck already know that Selkie isn’t human, based on his father’s casual reference to “Sarnothi” when talking to him? If so, how long as Truck known? Is Trunchbull going to become a grudging ally of sorts, considering his assessment of the situation? I’ve been wanting to see Truck become an ally since our last interaction with him. I’ve been thinking the same thing. I was thinking that if Selkie returns to school after this she’s going to be a target. And she’s going to need a bodyguard. Who better than Truck to fill that role? Amanda might be better than Truck. For one thing, her mother is more likely to approve. Of course, Truck’s penchant for not just physical intimidation but organizing groups of kids against each other, and the fact that all the kids know it, would likely be more than enough to dissuade any individual from messing with Selkie if he chose to let the other kids know that she had his protection. But Truck is currently in counseling for that kind of behavior, so he’d probably be reluctant to do it again, even if it was for a good cause. One reason for this is that if Selkie is forced to defend herself, one slip up and everyone will be turned against her. Poison saliva or claws will do a really great job of scaring everyone. If Truck mobilizes against the enemies instead of Selkie it actually helps Selkie keep a somewhat “ordinary girl” kind of behavior. A final thought: Amanda may help Andi sort this out considering Amanda’s known all along that Selkie isn’t human. They pretty much grew up together in the orphanage, all the kids in the home must know this. Selkie’s friends certainly do. Andi’s currently freaking out over something Amanda takes for granted and doesn’t really see as a big deal. With luck, some of that will rub off on Andi – fast. or the utterly shocked+terrified look andi is sporting – did she even see that bit on the tv or is she ‘only’ freaking out over selkie so far? if so, she´s bound to loose her sh# big time when she learns about it. either way, it does not bode well for the future, namely for todds visitation rights. did they ever get around to have him officially put down as amanda´s father? but even if they did, andi can still prevent amanda from visiting him and insist they meet at her place or in public – without selkie. …and just when the two started to become somewhat sisterish. damnit. Y’know, I had gotten a little disappointed when Truck kinda “concluded” his arc, and it seemed like he was not going to be part of the cast anymore (except maybe as a background character). It seemed like he could’ve had a longer redemption arc where he really came to grips with what he had been, how it affected his victims, how they treated him now that he was not bullying them, how difficult it was to keep his cool while being harassed back, stuff like that. Given how Dave had consistently proven that his “villain” types are relatable and never disposable (with, IIRC, the sole exception of the principal guy), I am looking forward to the likelihood of Truck’s continued involvement in this story. I could even see him passing information to Selkie about what his dad’s up to, if he learns that his dad’s doing something that might harm Selkie or her people. I could see him ultimately standing up to his dad when his dad is hell-bent on doing something disastrous. I wouldn’t be surprised if principal gets to make a comeback – him getting canned was in large part due to bullying a girl with “medical condition”, which now people will learn wasn’t the case at all. I thought he knew, others didn’t – which is why his comment got misread and due tonthe secrecy he couldn’t clarify. Like he’s a jerk either way but – of course she’s bullied she is sick vs of course she’s bullied she’s non-human – some people might have unfortunately agreed with the later. This is a school, not a place of business. You generally don’t every get a second chance when dealing with people’s kids. Usually having a ‘problem’ like the principal had is grounds for a career change. Or retirement. Also: Oooh, intrigues! Maybe all is not as it seems. Oh I see… less relief, then. More excitement! I don’t always trust Andi’s decisions when she goes all “Momma Bear” about her Precious. I don’t always trust Todd to keep his temper. I certainly have a great deal of reservation about Truchiepoo and Ms. Haversham-Zang; they are both unexplored characters, and make off hand comments leading me to think they have a great deal more information than than they are letting on. Of course Mrs. Haversham-Zang has a lot more information than she’s letting on. So does Agent Brown. But they also both care about Selkie. When your big WMD misses and fires into the sky, remaining hidden really isn’t an option anymore. I may need to re-read some strips but, I thought that beam in the sky was from Selkie’s eyes? Hence the need for sunglasses til she gets control of her new powers? I don’t believe that the attack was aimed at the refugee colony. 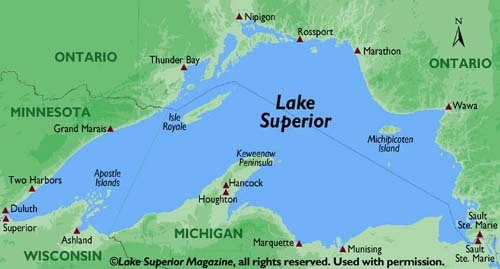 If you check for an aerial map of Lake Superior, you see that it matches the lake where the beam originated from. I doubt the US government would put a Sarnothi refugee colony in the same lake that was then currently home to an ongoing war so the colony was likely nearby and the beam was just the results of the war in Lake Superior, the Sarnothi’s homeland, coming to an end. You lost me there, Dave? Cyclops from X-Men, his name is Scott Summers. A few more things. I’ve spent the last hour and a half running the “highlight reel” on Sarnothi history, Selkie’s visit to the colony, her parentage, and Echoes for my husband to try and explain why this is the first comic on my list. 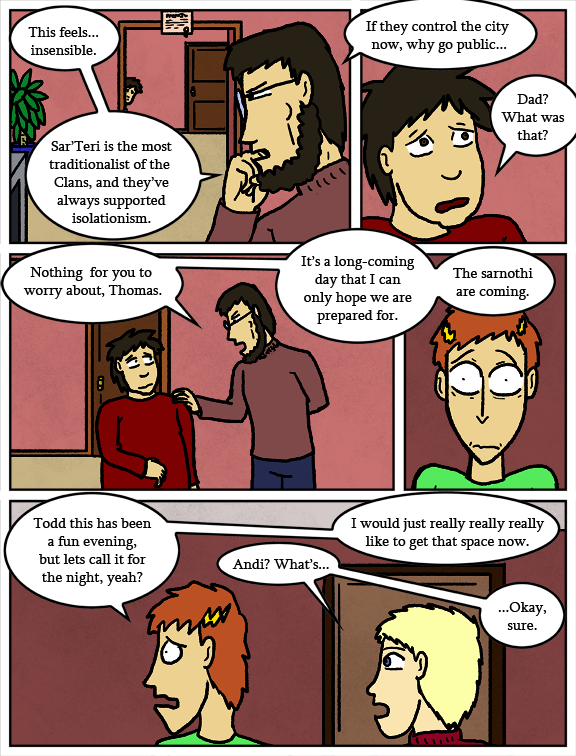 The other important bit from these most recent strips is the implication that the colony Todd and Selkie were visiting has been wiped out, and if Pants hadn’t attacked Todd and they ended up leaving so abruptly, they would still have been there when that happened. Maybe I’m overthinking this but it would seem as though there may be an informer within the resistance who knew that Plo Quar’s daughter would be there at the same time as Pohl and Scar – effectively destroying three of the four Echoes the resistance had. They wouldn’t necessarily know about the Suppressor that Plo Quar put on Selkie and they wouldn’t take the chance of her growing up to be as powerful of an Echo as her mother. 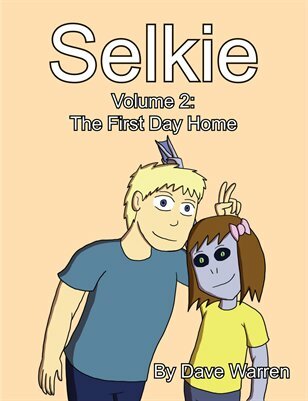 Gien might not be the only one to figure out who her father must have been, either. And now, thinking that all the Echoes are dead (assuming they don’t know Plo Quar is still alive), this broadcast happens. The Sar’Teri don’t have to do anything to the refugees now, they can count on human mob mentality to do their work for them. Pohl isn’t going to be able to go to work now. Not easily. Selkie isn’t going to be able to go to school. You can guarantee anyone who has ever met a Sarnothi and been told the person has a “rare genetic condition” remembers that encounter and is going to be fighting furious at the deception perpetrated by their government. Cern is an evil, murderous, manipulative, bas … uh … person whose parents never married. And I can’t wait to see where this is all going. Where was it said or implied that the refugee colony had been wiped out? Considering this is all happening within a week or so of the visit; Agent Smith ought to be much more stressed out with his domestic life. You seem to be jumping the gun a bit much. Sounds to me an awful lot like the refugee colony got hit. I think… I HOPE, that the refugee colony would have counted among the refugees that the land governments told them not to touch for fear of military consequences. Not that it would bother me if Gien died. He kind of has it coming to him. But Scar and the others don’t. I asume they blew up another of those big towers in sarnoth proper. It just occurred to me that if they think they got the other three Echoes (including Selkie) and they know Plo Quar is alive, this would drive her out of hiding to try and get revenge. Great. I’m really, really, REALLY hoping that Agent Brown can help them. Selkie’s life at school is going to become complicated. DX Possibly unsafe thanks to King Jerkface. I believe Mr. Trunchbull still doesn’t understand the concept of intentionally screwing your own people over to get what you want. To clarify, he has always thought himself in the right due to his ego, and therefore has never intentionally done wrong to the people he cares about (as far as he’s concerned) and didn’t get a reality check until the Truck incident. So while seeing someone essentially commit political suicide to his people sends a red flag to him, he has no idea how it makes sense. Which is funny, since he was the first person to expect a Saronthi war, but clearly doesn’t see what the steps and setups are to get said war. Hopefully he’ll come back and learn that he’s not as smart as he thinks he is. I don’t know if it was the refugee colony that just went boom…but, at the least? That masquerade? It just went bye-bye. The overplot has officially hit the main stage.